AT&T, however, is not without its own troubled history of causing its customers anxiety and frustration with its business practices. Getting rid of unlimited data, which was a key differentiator for many of AT&T's earlier wireless offerings in the smartphone boom, tended to upset customers becaused they felt the brand was forcing them to accept change to a world with limited buckets of shared data, complete with overage charges and everything. 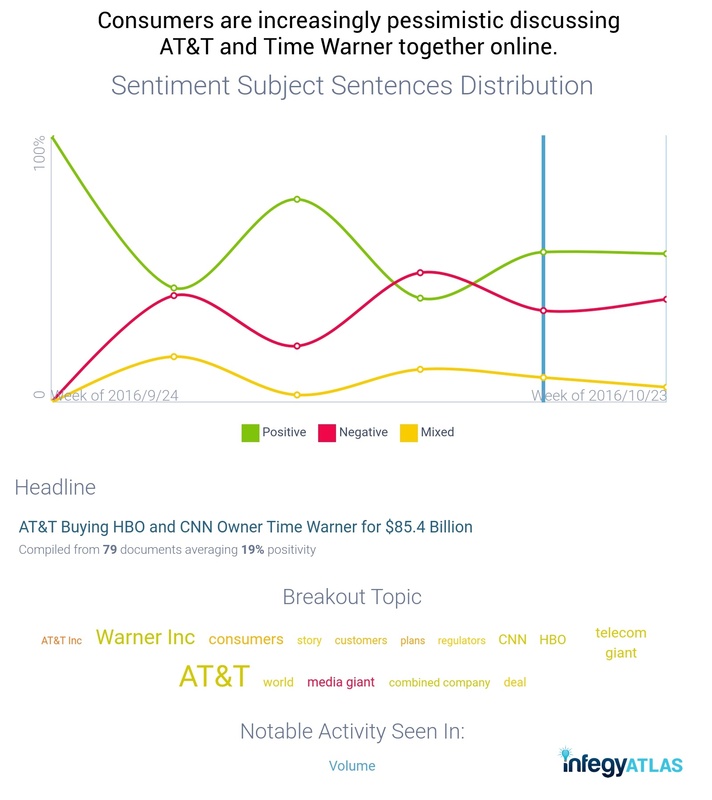 How are consumers reacting to the AT&T/Time Warner merger in social data? Not well -- or, not as well as these brands would like to be faring with consumers ahead of a looming regulatory battle. It's true that public brand sentiment is generally positive about the merger -- for now. First, the merger was just confirmed in the media over the weekend, which means there is as yet a short timespan of dialog regarding the AT&T/Time Warner deal for us to analyze. We'll have a more complete understanding of how consumers feel about this acquisition as executives from both brands fill in the blanks by responding to the numerous concerns voiced that people are just better off leaving the two companies entirely separate. Second, because both AT&T and Time Warner have been around for a while, it's likely that they might show up in discussions among consumers in the past. Unless consumers explicitly signpost and identify themselves as customers of both companies, it will be difficult to segment them out from the rest of the general population. I suspect, however, that as more and more people join the conversation and express their own excitement and/or reservations over the proposed AT&T merger, it will become easire for us to understand how this particular group of consumers feel based on their online dialog. Emotional and thematic elements of the social media conversation surrounding the deal are mostly positive -- for now. Looking at the last three days of social media data, for example, these are the emotional elements of social media conversation social media conversation since AT&T and Time Warner announced their merger. Infegy Atlas scored the emotional content of conversations concerning the proposed acquisition, finding the majority of emotive sentiments are positive. Looking at our 'Purchase Intent' theme, for example, tells us that only 16% of social dialog is comprised of consumers using forward-looking language when they talk about potentially purchasing services from the newly-proposed media giant. Not only that, but 61% of the conversation is net positive in nature, which would indicate consumers talking affirmatively about buying services post-merger. Using the 16% purchase intent score as a baseline for the discussion around forward-looking conversations, we can track changes in this area of consumer dialog as it develops. AT&T and Time Warner, for example, would do well to investigate the areas of consumer conversation that seem to move the needle on Purchase Intent up OR down, and trace those elements of the conversation back to what consumers liked or hated about them, respectively. Admittedly, as conversations grow in general, we would expect to see a general suppression of thematic results overall, but still within reasonable ranges to allow us to connect the dots between the actions taken by both brands and their respective effects on consumer conversation. Consumers are posting about AT&T and Time Warner Cable with increasing pessimism -- which should give regulators pause, too. An important dimension of this proposed merger should be recognizing that AT&T and Time Warner are, respectively, giants in their own ISP businesses. Consumers frustrated with how both AT&T and Time Warner are posting with increasing negativity according to data from the last thirty days, which might indicate that the public's tolerance for even potential monopolies like the one proposed by AT&T/TWC is nearing an end. As you can see in the 'Breakout Topics' picked up by Atlas, for example, "media giant" is astoundingly negative in consumer discussions and growing in volume. It will be interesting to see if announcements and concessions made by either AT&T or Time Warner to appease regulators can effectively shape how consumers perceive this merger. Across all of the documents used for this analysis, for example, the top headline automatically generated by Infegy Atlas discussed the price tag of AT&T/TWC's proposed merger matter-of-factly, using 79 documents to do so: "AT&T Buying HBO and CNN Owner Time Warner for $85.4 Billion." In all of those documents, however, the merger itself was only discussed with 19% positivity overall. Given the growing trends of negativity and negatively-associated topics showing up in conversations concerned with the acquisition, it seems highly unlikely that consumer opinion will shift dramatically in a positive direction, if at all. Get our latest report on the telecommunications industry. We recently looked at purchase drivers for consumers in the telecommunications industry, analyzing how each carrier's consumers talk about their providers online. In the report, we also fit industry datapoints like churn and postpaid gross adds to existing supply-chain management models in order to understand how wireless brands currently evaluate consumer loyalty. Using that information as a baseline, we explain how brands, advertisers, and marketers can use social data to supplement their wireless customer acquisition and retention strategies. Check out our infographic at Adweek here, and don't forget to download your copy of the report using the banner below.